Summary: Ogden Whitney's Jailbird's Romance tells of a girl from the wrong side of the tracks who falls into crime. 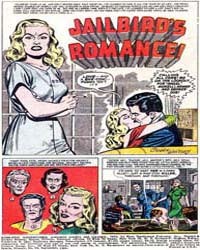 She goes to prison, gets out, falls in love, and then in defiance of the usual love comics ending she loses the guy she loves and goes back to prison. In my book that makes it a crime comic, not a love comic. Whitney used Craftint* board for his artwork.